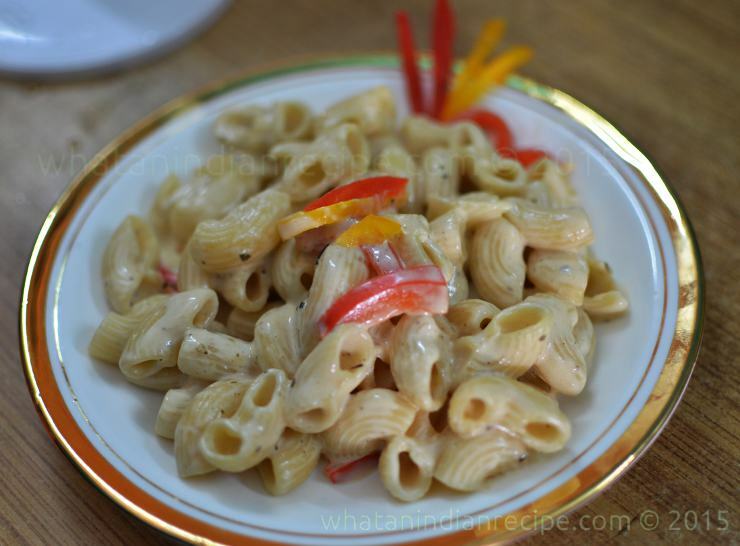 This cheesy & creamy pasta recipe involves no baking at all, easy to prepare & absolutely yummy. This recipe is a modification of the classic Mac & Cheese recipe, and I have added bell peppers for the crunch, and no need for baking, so it’s easier to prepare. Kids & adults will love this dish, serve hot, it’ll tast better. Boil the pasta as per the pack instructions, i.e. it must be el dante (partially cooked). Heat olive oil in a pan and add the bell peppers, stir lightly and add milk to it. After the milk comes to a boil add pasta seasoning, pepper, fresh cream, salt & cheese. Mix well. Once the gravy starts thickening add the boiled pasta to it, mix well. If it’s too dry add milk or cream as required & mix well. Check seasoning, serve hot.